I am back from my 4 weeks amazing trip with my family. I missed my stamping room and all my new goodies from the Annual Catalog that were waiting for me home. Classes are scheduled, ribbon share done, now is a time to update my blog. I want to let you know that Daisy Delight punch and bundle are back. They were so popular, that punch was sold out during a pre-order and was not available when catalog went live! I was the lucky one to get it, but was not able to have plan the class. Now it is back! Order yours as supplies are limited. This card will look great in any color, don't you think? 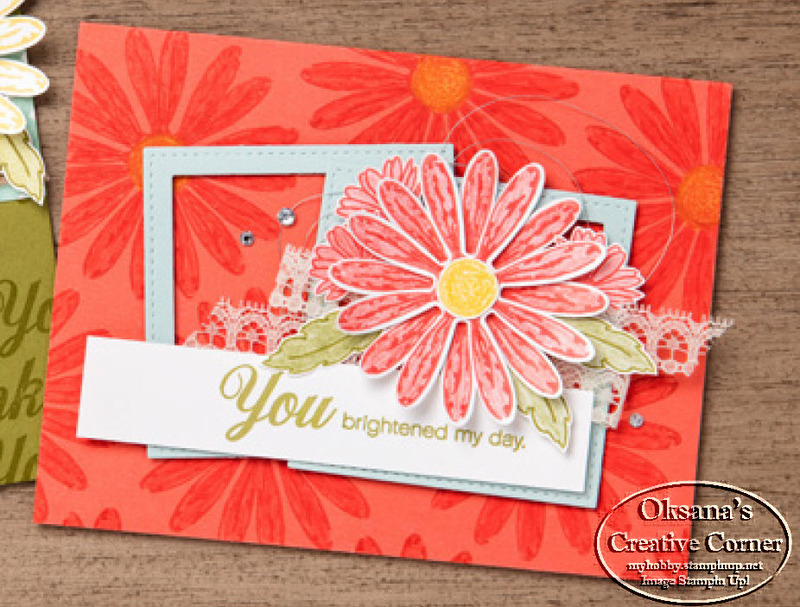 Stamp the daisy image in Calypso Coral ink on the Calypso Coral card base, then rotate the stamp and stamp again to create a fuller flower. Repeat to cover the card base. Color the flowers using Calypso Coral and Daffodil Delight Watercolor Pencils. Cut two hollow squares from Soft Sky Cardstock using the Big Shot and the Stitched Shapes Framelits Dies. Adhere them to the card using Mini Stampin’ Dimensionals. Fold and adhere a piece of 1/2" Lace Trim to the card. Stamp large and small daisies in Calypso Coral ink on Whisper White Cardstock. Color the images using the Calypso Coral Watercolor Pencil. 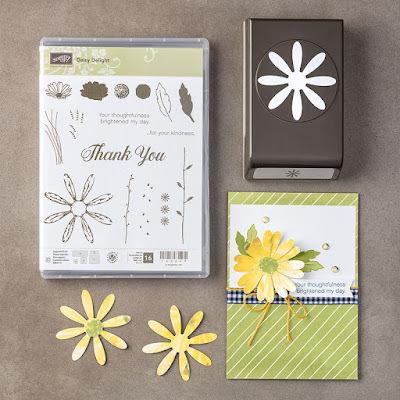 Punch out the two large daisies using the Daisy Punch; offset and adhere together using a Stampin’ Dimensional. Cut out the three smaller daisies. Wind a length of Silver Metallic Thread and adhere the thread and all the daisies to the card. Stamp a flower center in Daffodil Delight ink on Whisper White Cardstock and color it with the Daffodil Delight Watercolor Pencil. Cut it out and adhere it to the center of the large daisy. Stamp the sentiment in Old Olive ink on a piece of Whisper White Cardstock by combining words from separate stamps. Stamp three leaves in Old Olive ink on Whisper White Cardstock. Color them using the Old Olive Watercolor Pencil. Cut them out and adhere the leaves to the card using Mini Stampin’ Dimensionals. Adhere three Rhinestone Basic Jewels to the card.